This spacious four bedroom and family friendly Beaverhead Condo offers spectacular views of the Spanish Peaks. Enjoy the convenience of slope side living with its amazing location to the mountain mall and Yellowstone conference center. Un-clip and unwind with the White Wing beginner trail nestled just steps from your condo and warm up in your private indoor hot tub. With a spacious kitchen and two living spaces this large condo sleeps 12 and is the perfect home to entertain the whole crew! Big Sky is an outdoor enthusiasts dream in any season! 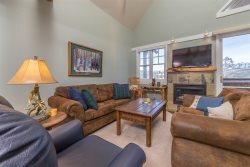 This condo gives you close proximity to Yellowstone National Park, fly fishing in the blue ribbon trout streams, white water rafting, Arnold Palmer golf course, mountain biking, zip lining, hiking, downhill skiing, Nordic skiing, snowboarding, snow shoeing and snowmobiling in comfort and luxury. Big Sky has it all! Big Sky Resort offers winter enthusiasts "America’s Biggest Skiing" with 5,800 acres, 4,350 foot vertical drop, and average annual snowfall of 400 inches. Lone Peak, at 11,166 feet, offers challenging runs, iconic chutes, while magic carpets at the base offer kid-friendly beginner runs -- all just steps away! In the summer, enjoy the endless trails for hikers and bikers alike! This home is a few footsteps to the ski lifts, conference center, shopping, restaurants, hiking trails, mountain bike trails, lake, and spa in Big Sky Mountain Village. It's just a quick 10-minute drive down Lone Mountain Trail to Big Sky Town Center, which offers numerous shops, restaurants, free concerts in the park, movie theaters, farmers market and much more. - Third bedroom: two twin-sized beds with bathroom just outside door. - Fourth Bedroom: two twin-sized beds (can convert to king) with bathroom just outside door. - Full kitchen with refrigerator, dishwasher, stove, oven, microwave, coffee maker, blender, toaster, Kitchen, bake ware, basic spices, trash bags, dish soap, dishwasher soap, sponge, and paper towels.